Quote from Ped7g : about user generated content... Scawen already wrote he's quite interested to release modding tools. It's just he expect so harsh changes to current LFS (also to graphics engine), that it doesn't make that much sense, letting user creating content, which may be obsolete by some patch later. And we are probably talking about huge changes (at least I hope for dynamic weather, live track, and daytime/lighting = physically based materials/rendering makes then sense = you can trash all current assets and redo them from scratch). This would lead very likely to completely redoing all materials/textures, and some modelling... So after the modding tools will be released, it will be much more difficult to release breaking change. Just see the current situation with LFW records, and physics incompatible patches. Some fixes to tracks are postponed years, so the incompatible patches are rare. With user mods officially supported this would be probably even worse. i agree with you but i agree with modding tools also. i think we just need modding tools for making real life tracks or unreal tracks but without change graphics engine for sure. my idea : 1 - tool for user making a track project (everything in track,grass,road etc..) ,2- some way to send project for Scawen, 3- a period of time for Scawen analyze (dimensions, if is real life track,etc... ) and accept or no , to come out oficial. even if the project needs corrections, it's more easy and quick fix than to create a track of 0, we see more content also. i dont know if we have easy way to doing this and i dont understand nothing about making tracks in any sims. so, sorry if this is a bit ignorante, just my idea. 1) There is no reversed version of all the combo's. It's not really doable to do this with help of the open config. It's an easy doubling of content anyway. 3) Tunnels and big parking lot should be accessible. Whats the point of making awesome tube tunnels which lead to nowhere? 4) There is no 4.. At the moment. Well, the pitlane exit is really wrong.. Unsafe like hell.. But hey, it's real life, laser scanned.. Nothing can be done, need to speak directly to Rockingham circuit, I get it. And maybe it's a tradition because the Westhill 2.0 (non reversed) pit exit is also terribly unsafe. 5) Overall, good job. Keep on rockin'. #1 is probably due to track licencing. I don't think any game has had reverse configs of real-life race circuits. GT is probably the best "proof" of this, as their fictional circuits all have reverse configs, except for circuits that are real-life circuits. Rockingham is looking lime Pheonix International Speedway, except cutting the dogleg cuts off .50 seconds (FO8 test). It'd be cool to see a full 40 car race. On that note, Thank you, thank you, thank for adding more AI drivers! As Dawedust says, it's because of licencing. Do you remember the last time you raced in opposite direction at Monza/Spa/MonteCarlo/etc.? Probably never as there was no game that offered it. I found the pitlane exit dangerous only on the courses with the chicane instead of oval part. The rest is fairly ok. Caution is always required, but nothing terrible. As stated, there are worse examples of pit exits. Quote from Kid222 : I found the pitlane exit dangerous only on the courses with the chicane instead of oval part. The rest is fairly ok. Caution is always required, but nothing terrible. As stated, there are worse examples of pit exits. This is something what developers can't modify. The track is real and LFS's one is an exact copy of it. Quote from Scawen : If anyone prefers to wait for our content updates before they buy a license upgrade, that is a reasonable decision. Kind of have to now that all my usual servers have switched to S3 content, which for me cost about $20 USD after the exchange rate and $2-$3 charge for the exchange. Time to launch LFS again just to try Rockingham. Will there be any other stuff coming for S3 users? 17€ for one track is quite expensive, IMO. Sorry if that has been discussed here earlier, I haven't read earlier pages. E: Sorry, I should have read the first post. Finally i test it by my friend account, deiviy, and played on it in single player, so im about to upgrade to s3 next week, but i think it will be great if rockingham includes dat spec which is in this video below, its just without collisions .. Already got WE parking lot, BL parking lot, AU parking lot. No need for another one. Quote from michal 1279 : As Dawedust says, it's because of licencing. Do you remember the last time you raced in opposite direction at Monza/Spa/MonteCarlo/etc.? Probably never as there was no game that offered it. Yup, a few people have guessed (probably correctly) that it's a licencing thing. Quote from R@fiXII : Scawen, will this reflections inssue be fixed anytime soon? Long answer : That was on my list marked as important! But there were so many things to do for Rockingham in the last two weeks, I couldn't do that. I think I can improve it a lot by (1) using a wider angle view for the upward rendered image and (2) applying a distortion function to transfer the rendered image onto the environment map. Number (2) must be done because if I only do (1) then there is some bad stretching. Also LOD must be considered as the wider views take more CPU / GPU. 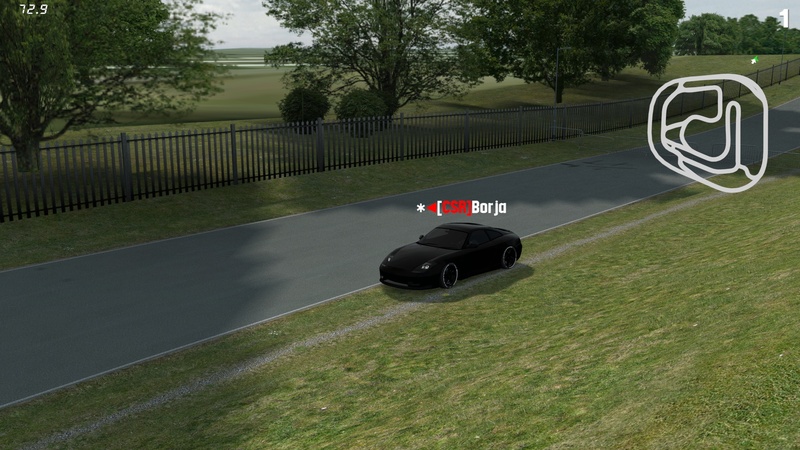 Quote from Flotch : Small note : when doing hotlapping on Sportcar config for example, if you do not take the first chicane and go through the cones (without touching them), you are still HLVC ok. Thanks, yes we must do something about that. I expect I can add something to the hotlap upload checker and we can reprocess those configs. The same issue extends to normal online racing. I guess there are also some nice short cuts across the grass on some other configs. For HLVC it's relatively easy but for online racing, we are in the early stages of figuring out some kind of penalty or delay system to prevent short cuts, in a realistic way. As another example, the same system could be used at Westhill International instead of placing dozens of tyre stacks there. Quote from Neilser : Yup, a few people have guessed (probably correctly) that it's a licencing thing. I don't really know what you mean by a licensing thing. I suppose you imagine we wanted to do it, asked Rockingham and they denied it. But no such conversation took place! It's simply that we don't want to add unrealistic things if possible. Reverse configs at real tracks are often dangerous because of the design of the barriers. Using the recently added start positions, we think you can simply use a layout to create reverse configurations. Hi there! I tried to get an S3 license through the shop but no success. I still have 15.8 GBP in my account and the system is asking me to enter a payment method anyway... Any hint? Quote : Reverse configs at real tracks are often dangerous because of the design of the barriers. Quote from rediske : Hi there! I tried to get an S3 license through the shop but no success. I still have 15.8 GBP in my account and the system is asking me to enter a payment method anyway... Any hint? If you enter the full price in the field "Enter the amount of credits you want to use for this payment :", you can select any payment method and it will just use your credits. It is quite confusing though, maybe the payment method could hide if the credits you enter cover the whole buying cost. Select a payment method. It works a bit weird but in the end your balance is used, not the payment method. Last edited by cargame.nl, Mon, 21 Dec 2015 14:59 . If there are no problem with Rockingham License, there will be no problem with the VW Scirocco? Also, I'm demo racer but i'm looking to buy S3, i'm waiting for some new cars(i played on s2 with an account of a friend of mine, i hope it's legal) how many cars will be added, and when? I play with my GT force on AC, but i had better feeling with LFS, love the tyre geometry. Quote from Flame CZE : If you enter the full price in the field "Enter the amount of credits you want to use for this payment :", you can select any payment method and it will just use your credits. That information should really be placed on the page with the payment options, if not another checkbox to select prepaid credit as payment method... Anyway! Let's all hav fun with the new content! Quote from Scawen : The same issue extends to normal online racing. I guess there are also some nice short cuts across the grass on some other configs. Yeah well .. Easily preventable without causing too many safety issues. My wish for quite some time already is to extend the color system to triple hex so you can assign any kind of color (input field).. For example grass-green so it blends in better and doesn't look so ugly. Also the 0.25 height/Z increments with LFS objects is sometimes too much. Being able to fine-tune would be nice.